After being selected for officer training in the British Army at the age of 15, Captain Hannah Winterbourne is now second in command over a company of 100 soldiers. 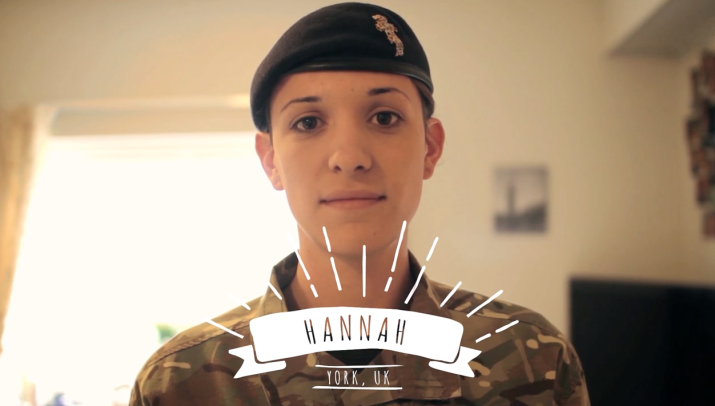 Hannah is also the highest ranking trans soldier in the UK. She came out one and a half years ago while stationed in Germany. It came as a shock to a few of her colleagues, but transitioning hasn’t held her back. She is now the trans representative for the British Army. Despite what some people may think, Hannah says that the British Army is a fantastic employer for trans soldiers, and they’ve had a trans policy since 1999 – so that their trans employees can get on with being soldiers. Helping her is Mel, a Private and the youngest serving soldier in the British Army – she’s also a trans woman. While she struggled in the early stages of her transition, she says that now being trans doesn’t affect her job at all outside of the occasional medical appointment. The film is part of the Patchwork Digital Storytelling Project that looks at the lives of transgender people of all ages and backgrounds around the UK. The series was commissioned by All About Trans and produced by Lucky Tooth Films in collaboration with Channel 4. Fox Fisher and Lewis Hancox of Lucky Tooth have been making films together since meeting on the Channel 4 series My Transsexual Summer in 2011. To hear them talking about the making of the Patchwork series and see clips, click here. Other films in the series introduce models, soldiers, artists, musicians, activists and psychics, who just happen to be trans – as well as their friends, partners and families. Early in 2015, Channel 4 will broadcast a selection of the films. December 20, 2014 in Uncategorized.